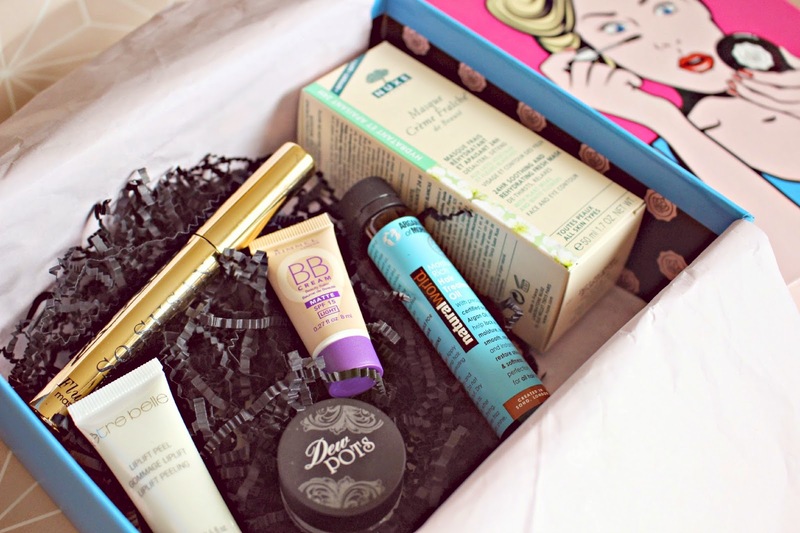 October GlossyBox – The Pop Art Edition! It’s always an exciting day when I see a Glossybox shaped parcel in my pigeon tray, and the October 2014 Glossybox is a slight twist on the usual monthly treats. The box has had a makeover, and the vibrant design is inspired by Andy Warhol’s Pop Art. Inside the box we are treated to four full sized products as well as two minis and the value of the products inside is around £50.00. There are four different ‘collectors editions’ and fortunately I was sent the pink one! A Nuxe Créme Fraiche de Beaute Mask, full sized, worth £19.50. This is a 24 hour moisturising mask, perfect for quenching the thirst of parched skin and ideal for giving your skin some nourishment as the air temperature drops. It is very soothing and reduces some red areas which I have – it is infused with plant milks and white flower, which give the product a light, delicate floral fragrance. Skin will also love the almond and Orange White Flowers which have skin-soothing properties. I think I will be reaching for this mask more as the cold weather sets in! Another product which is a cold weather saviour is the Être Belle Cosmetics Liplift Peel, it’s full size and sells for £3.60. I’m always applying lip balm and this one is rather different – it’s a scrub, but not in one of those pots which you have to stick your fingers in to get the sugary solution out (I hate that – so unhygienic!) It’s a gentle peel, you scrub it on to remove dead surface cells, and then wipe off with a damp cotton wool pad. It leaves behind a light coat of moisturiser and your lips are ready for even the most intense of lipstick applications. I have to be honest and say that I have not yet tried the So Susan Cosmetics Flutter Mascara. It’s quite pricey (when not in the box) at £14.95, and I just think there are already so many good hughstreet-priced mascaras out there which do the trick perfectly. The packaging however is very pretty and looks luxurious. The mascara is said to be formatted with hyaluronic spheres which help you to achieve intense dark curved lashes. Also in the box is the Natural World Argan Oil of Morroco Hair Treatment Oil. It’s a 20ml sample and the full 100ml bottle would be £9.99. It’s a handy size for putting in your travel beauty bag and can nourish and treat frizzy and flyaway hair. I’ve been applying it before blowdrying and brushing my hair to de-tangle and add softness. It’s a lightweight oil so doesn’t leave any residue in hair after use – which some Moroccan treatments can tend to do. I’ve previously proclaimed my fondness for MeMeMe cosmetics in this post here so was delighted to add to my Dew Pot collection with the Navy eye cream which came in the box. The dark blue shade is creamy and gentle to apply – I use a pointed brush to apply as a liner before buffing slightly over the lid. The final product is a handbag sized Rimmel London BB Cream, the full 30ml size would be £6.99. Unfortunately the shade is too light for me, but I gave it to a friend who said it provides her with plenty of coverage so hides blemishes and redness as well as containing ingredients to fight spots and treat oily skin. Overall the colourful October Glossybox contains some ideal products for adding to your routine now that it’s getting nippier – the SOS products will help our skin get through the winter months, and I’m positive that I’ll be getting a lot of use out of the products! As always, the box is worth so much more than it’s £10 price tag – this month it’s worth £50.00. You can sign up here to receive the boxes on a monthly basis. Have you received your October Glossybox yet? Which is your favourite product?